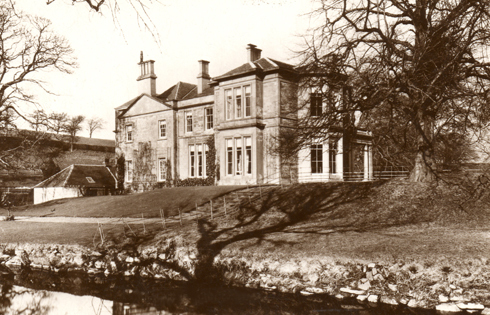 Pictured on the left is Millheugh House, Blantyre. This grand stone house was situated in the Calder, at the falls. (which would be just out this picture on the left). The picture was probably taken before the 2nd world war when the house still stood in all it’s glory. According to my Great Aunt Christina (who worked there as a young woman as a kitchen maid), during the 1950’s the owners fell upon hard times and the house became derelict. Squatters moved in and virtually destroyed the inside fittings and fixtures. Shortly after, and with house all but written off and in desperate need of repair both inside and out, it was condemned and raised to the ground, leaving nothing standing but the foundations. The rubble was all cleared offsite and taken to infill tip. This was a sad end indeed to a Blantyre house which was reputed to have been built in the 14th Century, and had it been standing today, would have ranked as one of the oldest houses in the town. A wealthy family named Millar owned the property from it’s initial build right up to the early 1900s. The most eminent of them was Professor John Millar (1735-1801) whom although born in Shotts, eventually inherited the house and estate. He became a lawyer in 1760 and only a year later became a Professor of Law at Glasgow University. He wrote 2 books, “The Origin of the Distinction of Ranks” in 1781 and “Historical view of the English Government from the settlement of the Saxons in Britain to the Accession of the House of Stuart”. The house was truly huge. It was square in shape, built of stone and with a grand entrance with columns. Stone gravel paths allowed horses and carts to come in from the the nearby Pech Brae and the estate pictured here in 1910, was well tended by gardeners with green iron fence railings. In this photo to the left, the falls would be directly to the left of the house, the river in the foreground. Nothing remains of the paths or the house today, although i recall as a child i could still see the house foundations exposed. Today, the Calder has claimed everything, now covered in grass. It’s a local rumour that some of the squatters are still alive today, and although very elderly still live within the town. 28/04/1947 0h 45m am so according to your website my mum, dad might have been squatters, could this be true. That would need double checked Willie. The 30s and 40s were tough times for people in Blantyre with a real lack of housing. It forced many families into making decisions that were acceptable for them then, and perhaps not so much these days. 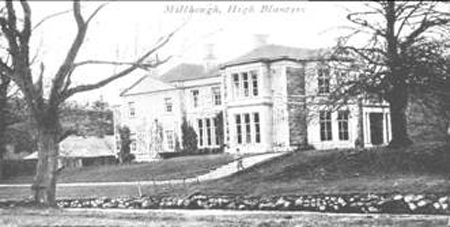 Certainly the post WW2 years for Milheugh House were habited by many people.